This just isn’t any apartment accommodation in Broadbeach Gold Coast, it’s beachfront and very accessible to all the good things that are essential for a break in Queensland. There is plenty of shopping just around the corner at the Oasis Shopping Centre, and a seemingly endless list of dining options. Whether it’s a simple holiday beside the beach or something more textured and varied, then Sandpiper Apartments will provide you with an excellent Broadbeach accommodation base from which to explore everything that Broadbeach and the neighbouring parts of the Gold Coast have to offer. The Sandpiper Apartments make the perfect pied-a-terre for romantic escapes and weekend adventures. 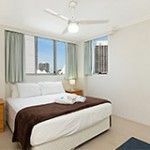 Stylish and generously sized apartments, whether you choose a one or two bedroom option, their economical tariffs make it easy to turn an overnight break into the whole weekend, or a few days with the family into a weeklong sojourn on the Gold Coast. The easy atmosphere of Broadbeach is a very enticing, though intangible drawcard that can only be appreciated once you are here. Our location is also very advantageous for the visitor who has come to Broadbeach to catch a dinner and a show at Jupiters Casino. Put on your dinner suit, or party frock and head to the Oasis Shopping Centre for the free monorail trip to Jupiters. What a great way to travel. No fuss. No hassles. Just fun all the way there. And back. Back at the resort, the pool area cuts a lovely shape in the courtyard, and the sun loungers dotted around the pool set the scene for some relaxing hours beside the pool. The pool and spa are maintained to very comfortable temperatures all year round. The beach in front of the resort is also fully surf patrolled so it’s a straightforward decision to take the kids swimming or surfing. 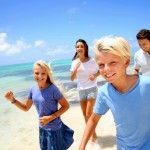 Our Accommodation in Broadbeach Gold Coast provides you with excellent value and a handy location from which to launch your Gold Coast adventures. 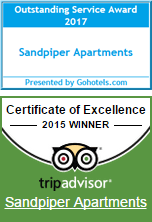 Make sure you book your next Gold Coast holiday accommodation at the Sandpiper Apartments.